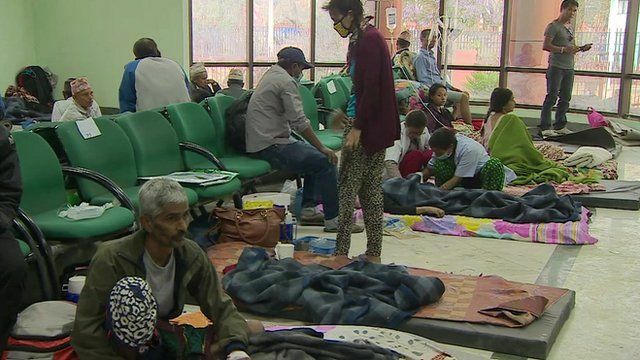 Quake victims treated on hospital floor Jump to media player More than 6,500 people have been injured in Nepal's earthquake -Yogita Limaye reports from inside one of Kathmandu's overwhelmed hospitals. Avalanche survivor: Nowhere to run Jump to media player A survivor of the devastating avalanche that hit Mount Everest base camp after the Nepal earthquake has described the moment the snow hit. CCTV captures violent Nepal earthquake Jump to media player New footage has emerged of the moment the devastating earthquake struck Nepal, after several Chinese photographers arrived home on Sunday. At least 4,000 people are now known to have died in the catastrophic earthquake in Nepal at the weekend, with more than 6,500 people injured. Rescue teams are still trying to reach many remote and mountainous areas, amid reports that some villages have been completely destroyed. Yogita Limaye has been to some of Kathmandu's overwhelmed hospitals.